For medieval clergy, monks and nuns, the psalter had a daily familiarity. Throughout each day, they recited a certain number of psalms in the divine office ('hours' or daily prayers) as well as hymns and prayers based on them. The psalter provided hymns and verses sung at mass. Devout lay people, too, relied on the psalter as a personal prayerbook, and it had always been central to Jewish services and personal devotion. The psalms, well-known and loved, were among the first parts of the Bible to be written down in languages in current use. This one belonged to the Augustinian monks at the Priory of the Holy Trinity. Most of its pages are divided into three parts, with on the left St Jerome's Latin translation of a Greek one from the Hebrew ('Gallican' translation) with notes, on the right, a French or English verse translation of the Latin and at the bottom of the page, prayers. 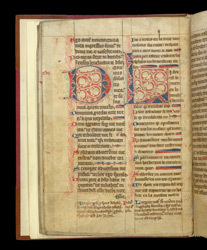 This page has the end of Psalm 40 (41) ("Blessed is he who has regard for the weak") in Latin on the left, with French verse translation on the right. In the lower margin, salutations or hymns to the Blessed Virgin were written by the same scribe who wrote the rest of the page. The wear on the page probably comes from every-day use of the book.